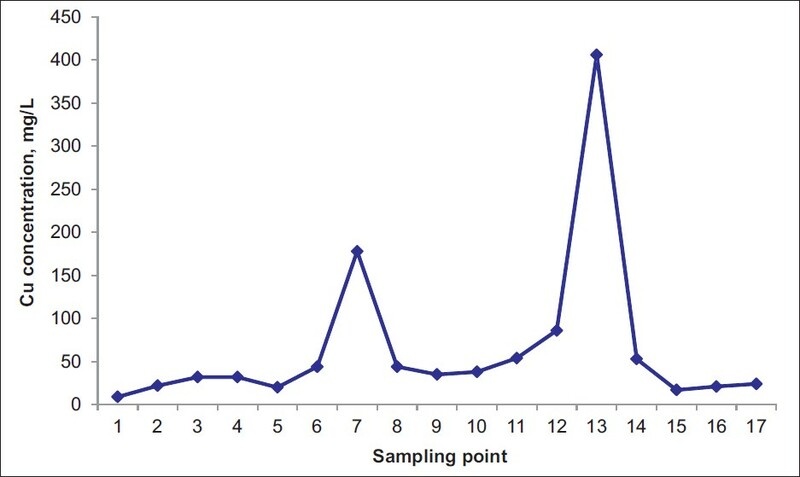 Aims: In this study, the concentration of PM10 and PM2.5 in eight station of Khorramabad city was analyzed. Materials and Methods: For this study, the data were taken from April 2010 to March 2011. 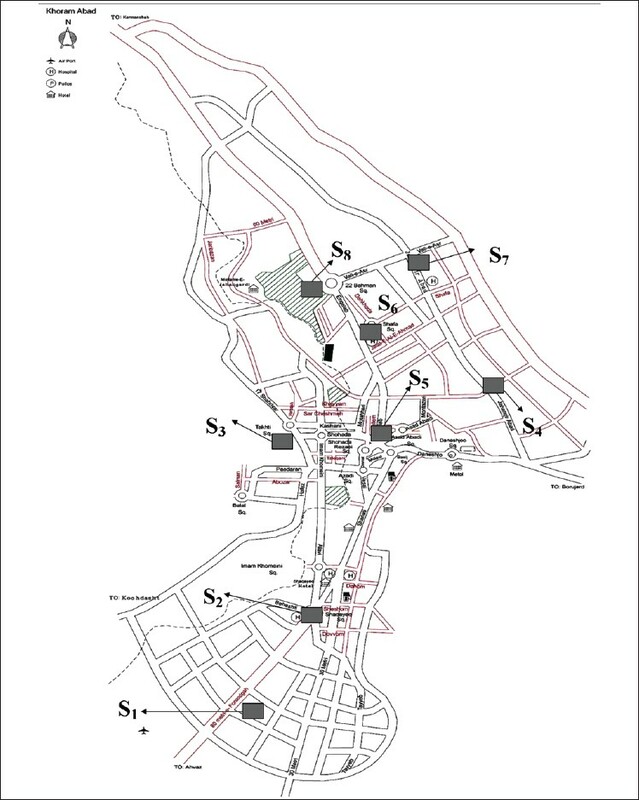 The eight sampling point were chosen in account to Khorramabad maps. During this period, 240 daily PM samples including coarse particle (PM 10 ) and fine particle (PM 2.5 ) were collected. A two-part sampler was used to collect samples of PM. According to one-way ANOVA, multiple comparisons Scheffe, the obtained data were analyzed and then compared with the Environment protection organization standard rates. Khorramabad Results: The results revealed that during measuring the maximum concentration of PM 10 and PM 2.5 was respectively 120.9 and 101.09 μ/m 3 at Shamshirabad station. There was a significant difference between the mean values of PM 10 concentration (μg/m 3 ) in the seasons of summer. In addition, the mean concentrations of PM 10 in warmer months exceeded to the maximum permissible concentration. Conclusions: Year comparison of PM 10 and PM 2.5 concentration with standard were revealed particle matter concentration in summer season was higher than standard. Although total mean of particle matter was less than standard concentration. Aims: This research was conducted to determine the concentration of Zn, Cu, Pb, Ni, Cr and orthophosphates in the soil of the river bed from Zayandehrood dam to Gavkhoni wetland. Materials and Methods: This cross-sectional study was conducted in the Zayandehrood river of Isfahan, central area of Iran. Seventeen points were sampled through the upstream, Zayandehrood Dam, and downstream, Gavkhooni Wetland, of the river. The samples were selected from soil of the river bed at certain locations during 6 months. Heavy metals and orthophosphates analysis was done by Atomic Absorption and Spectrophotometry methods, respectively. Results: The results indicated that concentration of heavy metals and orthophosphates increased from upstream to Choom bridge in downstream of the river and then decreased from this point to Govkhooni wetland. In the first sampling point, the concentration of Zn, Cu, Pb, Ni, Cr and orthophosphates were 29, 9, 51, 83, 49, and 570 mg/kg (dried weight). For Choom bridge it were 1413, 406, 289, 123, 86, and 104 mg/kg and in the wetland were 820, 24, 49, 68, 87, and 88 mg/kg (dried weight), respectively. Conclusion: The metal concentration from the first point to Choom bridge has been increased and then has been decreased in the wetland. The maximum amount of Zn, Ni, Cu, and Pb in the river bed was higher than and closer to maximum allowed concentration of heavy metals in soil (mg/kg dried weight) and for Cr was within normal limits. Industrial plants located on the banks of the river, widening of the river in downstream and entering the drainages to the river are among effective factors in these changes. Aims: The aim of this study was to survey the health problems caused by exposure to high-voltage facility radiation. Materials and Methods: Sampling included workers exposed to electromagnetic fields at high-voltage facilities. The strength of the electric and magnetic fields was determined by a field meter. A questionnaire was used to evaluate the prevalence of subjective and psychological symptoms. Statistical descriptive used and data analyzed by a Student's t-tests. Results: This study indicates that increased symptoms among the exposed workers including depression, anxiety, hostility, paranoia, inter-sensitivity, and obsession-compulsion. Some of the self-reported symptoms were, headache (53.5%), fatigue (35.6%), difficulties in concentration (32.5%), vertigo/dizziness (30.4%), attention disorders (28.8%), nervousness (28.1%), and palpitations (14.7%). A significant relationship was observed between the exposure to the electromagnetic field and psychological symptoms (P < 0.05). Conclusion: Radiation of high-voltage facilities probably increased the risk of mental disorders and intensified them in susceptible workers, especially depression. This finding confirmed the results obtained in provocative studies that indicated an increase in the risk of psychological symptoms, which was put forth by several investigators Observation of occupational health and other control measures play an important role in decreasing the symptoms.